This is the second year that Meachers Global Logistics has been involved with the South Coast Business Awards and are proud to do so. 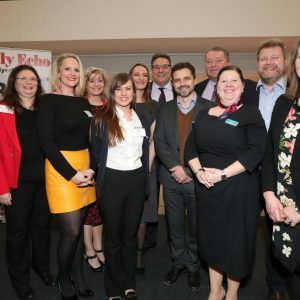 As a family run business Meachers strives to help and support the local business community and felt it was time to recognise some of the fantastic businesses we have on the South Coast. The Meachers Export Award will really help to showcase all of the businesses within the region who are making an outstanding contribution to the Hampshire/UK economy through the export of products and services. Meachers can’t wait to see what the South Coast Businesses have to offer. This award will be presented to the company who has made an outstanding contribution to the Hampshire/UK economy through the export of products and services. The judging will focus on innovative sales and marketing, sustainable export growth, value and contribution of exporting to business expansion, evidence of sustainable competitive advantage and the overall company commitment to international business. The viability of your company, its product/service and how successful your company’s exports/international business activities have been this year. Indicate what the competitive edge of your product/service is in the marketplace. In your key markets, what did you do to secure international contracts and market acceptance? What actions did you take? – e.g. product adaptation to meet customer preferences, building relationships with distributors and buyers, addressing cultural issues in marketing materials and products, attending trade events, techniques to overcoming buyer resistance. Explain your company’s strategy in gaining a secure foothold in any new markets or how you enhanced brand in established markets. Structure of your export/international operations and systems to effectively respond to export/international sales as well as whether your company is appropriately resourced for export expansion. Evidence of sustainable business practices. What are your export plans for the coming year (e.g. new markets, additional staff, different marketing strategies). Clear statements that indicate the soundness of your company’s financial strategy for international business. Examples of a sound capital base (substantial net profit) and sufficient capital (cash & resources) to support export activity.